Our Current litter was born on the 23 December 2018 and rady to go to their new homes. Two kittens have already been place. Loki has gone to Sydney and George will be going to Melbourne. 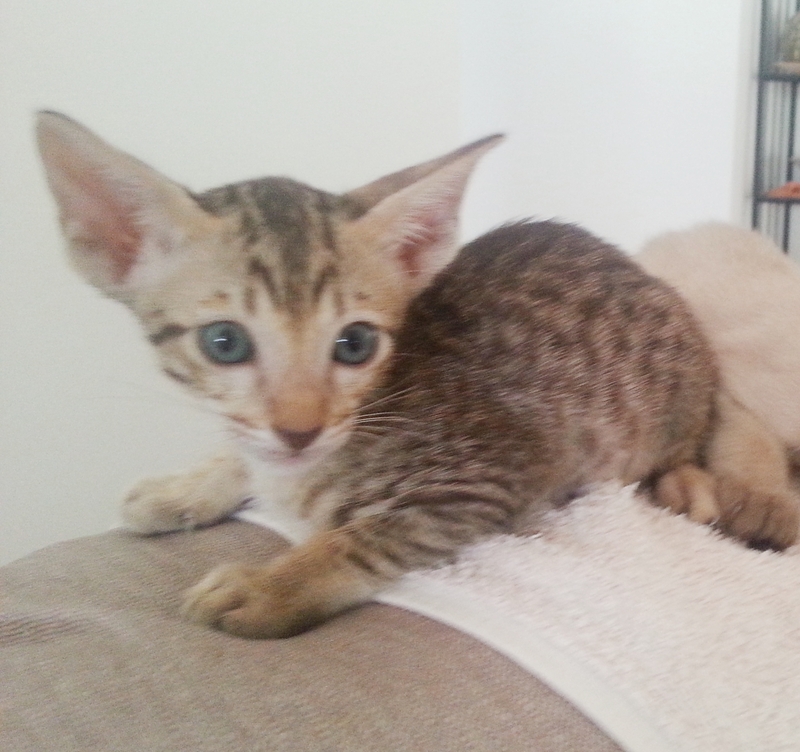 We have 2 Oriental kittens available. Our current litter is very playful. If they are not running all over the house they are sleeping in the back of the sofa. It is very hard to take photos. Someone has to sitting down with a kitten in their lap. Kittens leave here at about 13 weeks. They will have received the 12 week vaccination, been microchipped, toilet trained with Breeders Choice and desexed. Cost is $850 each plus any costs of transport. They have been trained as indoor pets only and will sleep on your bed if you allow. Kittens do not leave our home before they are at least 12 weeks of age. They will have received their first vaccination, been desexed and Microchipped. By this time, they are house and toilet trained, eating a wide variety of food. Our kittens are raised as house pets and have never been allowed outside the house. We recommend that you keep your pets inside where possible. If you want them to be allowed outside, we recommend that you build an enclosure attached to a window so that they can come and go in safety. We do not accept deposits on kittens under 6 weeks. Please contact us to find out when we will have the next litter. Our girls are only allowed 1 litter per year to enable them to recover properly. New photos will be on this page as soon as the amateur photographers can get some good pictures. The kittens should be ready for viewing at about 6 to 8 weeks of age. If all things go well, they should be available to go to their new homes when they are around 13 weeks of age. All kittens will be available after vaccinations, microchipping and desexing. It is possible for a Microchip to move around from the injection site. Microchipping is now required by law. If you are looking for a present for another person, please bring them along as what you choose may not be suitable for the intended owner. Kittens are ready to go to their new home at approximately 13 weeks depending on their personality development. Each kitten will have received their first vaccination with the next due 4 weeks afterwards. Please ask for the F3 vaccination as a small number of our kittens have had a bad reaction to the F4 vaccination. Yearly vaccination renewal is then required. 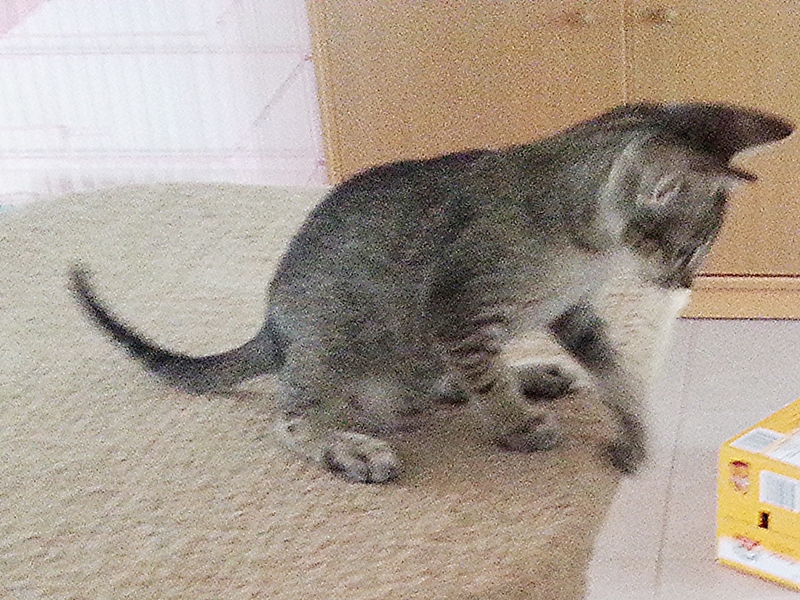 The F4 vaccination may be given at this time as the kittens immune system has matured. are very intelligent and also very loving and loyal. 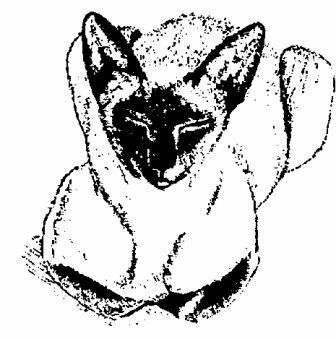 They are active and tend to connect strongly with their owners. The kittens here are fed primarily on fresh foods in preference to commercial though they will eat anything put in front of them. Their diet includes regular additions of chicken pieces - generally either wings or drumsticks. A diet sheet listing their current diet is sent out with every kitten which leaves our premises. 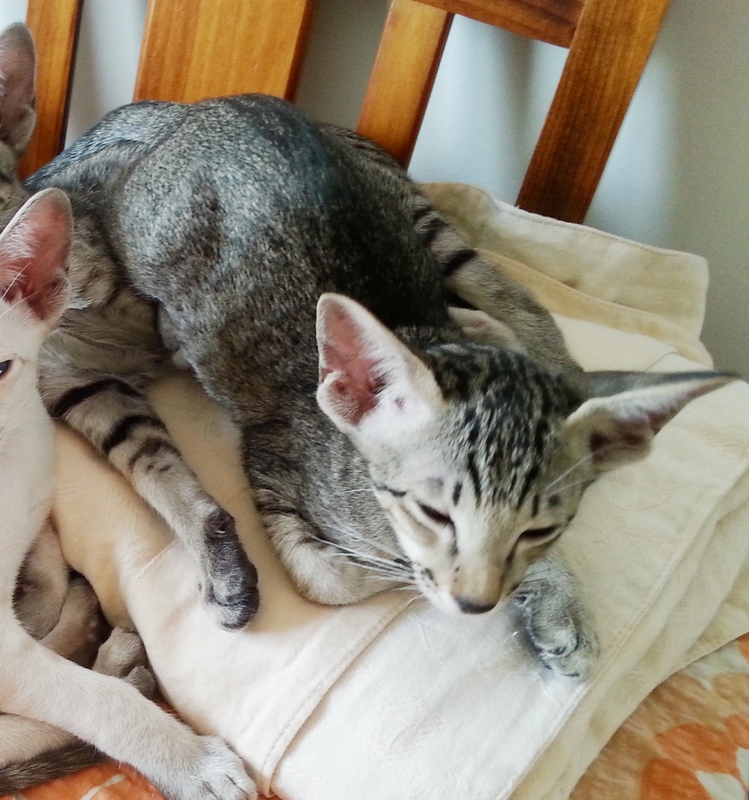 All the kittens are trained to be house pets and companions and We strongly advise new owners to keep them inside only. Any time outside to be either on a leash or in a purpose built external run facility. If you would like one of our babies, please remember that you will need to train the kitten to how YOU would like them to behave in the bedroom. As it would get rather crowded in our bed if we did this! Or copy "sekicats @ outlook.com" to your email software and remove the blanks. International Costs will be higher because of export requirememnts for Special Veterinary Examinations and International Microchipping etc. 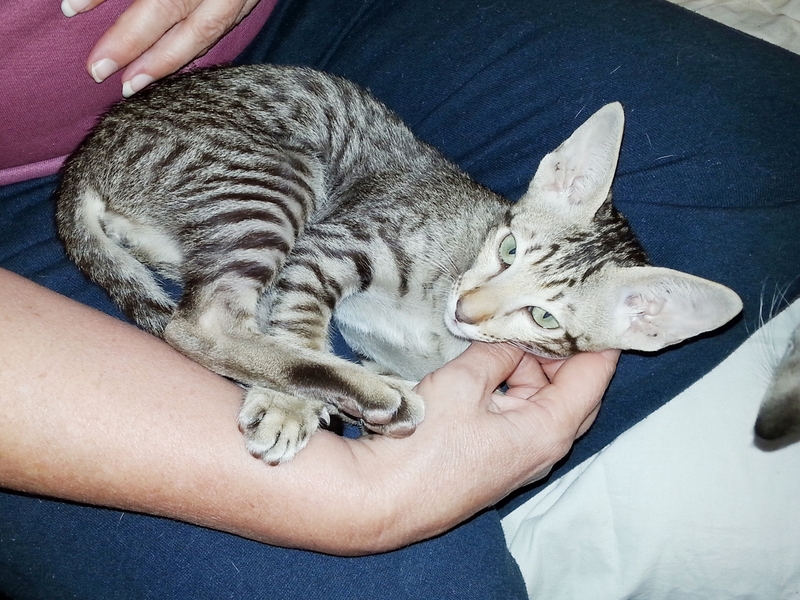 We will be placing some photos of any new kittens here when available. Click here to leave a Review of our business via AussieWeb Local Search.